Once a year, the Olympic venue at Soldier Hollow hosts world-class athletes of the canine variety. It’s the Soldier Hollow Classic….and it is a sight to behold. If you’ve seen the movie “Babe” (or watched any Welsh television) then you know what I’m talking about. 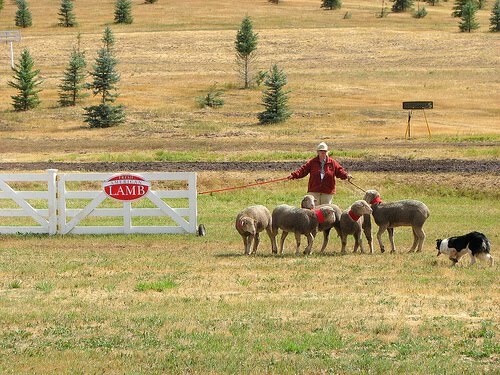 Except—and let me be perfectly clear about this—the Sheepdog Classic involves real live dogs and no animatronic talking pigs. No pigs at all. Sorry. However, there is actually a movie in the works about this event. Make no mistake, this ain’t no beauty pageant. These dogs are tough and smart and amazingly skilled. (Okay, and beautiful too.) 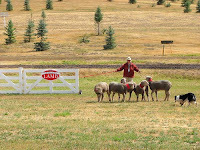 Dogs and their handlers come from all over the world to compete here. It’s mesmerizing to watch them work. Bring binoculars and/or a zoom lens for your camera. The course covers a large area running at least half a mile up into the hills. There is plenty of parking at the venue, but expect an additional charge. Stadium seating is available. You may also bring chairs or blankets and sit on the graded dirt areas; that’s what we do since it gets us a little closer to the dogs. Stay for the medals ceremony and you get a Scottish bagpiper brigade as a bonus. P.S. I owe my discovery of this event to my sister, a Heber Valley resident. Thanks, sis! You wouldn't think it would be that exciting. I didn't expect it to be. But it is! It's really entertaining. And what those dogs an do is amazing. I swear they're human. Excited to go this year! And that area is beautiful. It's a great time of year to go enjoy the ambiance of outdoors. No pigs at all? I totally would go to this!